Yunnan began to process tea in the Three Kingdoms period (220-360). Allegedly, at this time Zhu Ge Liang from Sichuan, a clever tactician, encouraged the Yunnan people to cultivate tea to improve their lives. Still, Yunnan people call Zhu Ge Liang their tea god. He is still prayed to in the south of Yunnan where he conquered more that 2000 years ago. This is the area of Xichuanbanna and the six famous mountains. At the heart of Yunnan’s south west is the city of Puer, the base of the province’s ancient tea market, and from where “puer tea” derives its name. (The city Simao in 2007 changed its name to Puer, and should not be confused with the ancient city). From Puer city, tea was distributed to Tibet, and South East Asia on “tea horse trading roads.” The rough terrain of Yunnan demanded efficiently packed tea, so compressed cakes of tea were wrapped and tied into stacks of seven and enclosed into a bamboo shell. For this reason, certain puer cakes are commonly labelled “Qi Zi Bing” or literally Seven Piece Cake. Carrying tea though the humid rain forest over the long, hard trading routes may have encouraged natural fermentation. South East Asia. The popularity of puer has even started to spread to the US and Europe. All puer tea starts out the same. The basic ingredient is called mao cha. Mao cha is harvested and allowed to dry in the sun. Yunnan is the only tea growing province in China that has a lot of high altitude sunshine and blue skies. One of the side affects of all this sunshine is some very large leaf tea plants. All tea originated in Yunnan, but you might be surprised to know that the tea plants are called Camellia Sinensis Assamica. The reason is that when the British found the variety of tea growing in India they named it Assamica and believed that it was wild, but it had actually been planted along the old Silk Road that ran from Yunnan and Burma into Assam. Even though the origin issue has been cleared up, the ancient tea trees in Yunnan have kept the inaccurate name. 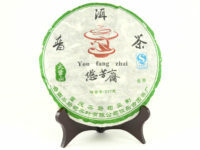 The quality of the mao cha the most important factor in making puer. The ideal mao cha is two leaves and one bud. Farmers typically bring their mao cha to towns and villages where it is purchased by local buyers and sorted and then purchased by puer producers. Although relatively large areas may be favorite places for certain producers to buy their mao cha, the cultivation is done by small farmers. Since puer has become more popular, many farmers are cutting their old trees to create bushes which have a better yield, so the number of old trees is decreasing every year. Most commercial puer is a blend of mao cha from different areas and there are some producers that will reveal the areas in Yunnan where the mao cha originated. These kinds of details enhance the value of the tea over time, and we try to supply this information whenever we can. The tea grows in high mountain areas and the mao cha is brought now to the villages in the valley once a week to be sold. The process hasn’t changed for centuries. Puer is separated into ten grades determined by leaf size, with the largest being tenth grade. In understanding about grades, it is wrong to assume that the 1st grade is the best grade for puer. There is only an incidental correlation between the grade of the puer and the quality of an individual cake. For example, some of the most sought after tea is made from maocha that is larger than tenth grade tea. It is always a question of taste. Of course if a lot of expensive buds are used in a cake, it will drive the price up, even if it is not considered a good candidate for aging. So don’t be strictly guided by the grade, think also about the uniformity and tightness of compression and the overall flavor achieved by the cake’s mao cha blend. When shopping for puer here are some very general guidelines. Look the cake over to see if the leaves are uniform through the cake, and pay attention to the compression of the cake; it should not be too tight, or too loose. Look at the color – for a cooked cake, it should be dark with red overtones; for a green cake the leaves should be dark green with silvery overtones. Smell it if you can, and leave it if it smells like a farmer’s sock. Don’t believe out of the ordinary claims, and don’t buy old puer unless you know someone that really knows what they are doing with puer. Remember that tea producers are country people, and like all country people they have a distinct distrust for outsiders, so claims of outsiders from Taiwan or Hong Kong, etc., claiming that their supervision of the country people has made the product more authentic, well, if you know country people you can fill in this thought. Buy from people that you have developed trust over time. There are many honest traders, and they have a long history in the market.